LiveCode LessonsData GridLiveCode Data Grid Working With Data Grids (Forms & Tables)How Can I See What The Data Grid's Internal Array Currently Looks Like? 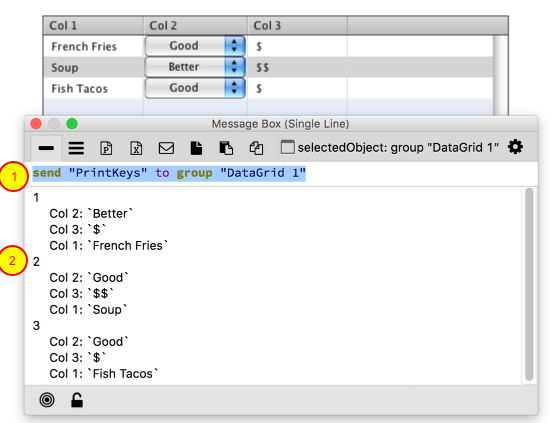 A data grid has a helper command that will print off the first line of each key in the internal data array. If you need to quickly see what the internal array looks like just send "PrintKeys" to the data grid (1). This will print the array in the message box (2). Note: You should not rely on PrintKeys for anything other than taking a quick peek at the array. It only prints the first line of each key so it is not a 100% accurate view of the data. Prev: How Do I Use A Template In Multiple Data Grids? Next: How Do I Get Aggregate Values for Columns?